Aloe Vera would be considered more of a plant than an herb, however there are natural healing solutions for hair using aloe vera. I personally have used aloe vera for burns, and I’ve bought shampoos that claimed health benefits by the presence of Aloe Vera (but honestly, how much aloe vera do you think they had?). AloeVera is awesome for your hair! Hair issues, such as hair loss or thinning, excessive frizz, dryness, or oiliness, as well as scalp conditions, including dandruff, scaly, or itchy skin, plague millions of Americans each day. Aloe vera shampoos and conditioners have been around for years and serves as an ideal alternative to commercial hair products. For gorgeous, healthy looking hair, try natural aloe vera. Aloe vera can be used as a safe and natural treatment to prevent hair loss. It is great for both men and women to promote new hair growth in places that have experienced hair loss or significant thinning. Aloe vera stimulates the production of new hair and may even lessen the effects of Alopecia. The aloe vera plant is packed with essential vitamins and minerals that aid in restoring hair’s strength and beauty. When combined with coconut milk and oils, such as wheat germ oil or jojoba, aloe vera gel can make a revitalizing shampoo that not only works to prevent hair loss but also promotes new hair growth. Aloe vera gel can be added to favorite shampoos to deliver nourishing benefits. When combined with herbs, essential oils, and plant extracts, the nutritive benefits of aloe vera are multiplied exponentially. The natural enzymes found in aloe vera can soothe and moisturize the scalp, helping to eliminate the scaly dryness that causes dandruff. It also helps to increase blood circulation in the scalp, which works to stimulate the production of moisturizing oils. Aloe vera reduces the dry, itchy feeling that accompanies dryness or oiliness. It keeps the hair’s natural oils in balance to prevent excessively oily or dry scalp. 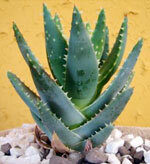 Aloe vera also brings a refreshing and cooling sensation to the scalp. Aloe vera acts as a natural conditioning agent that restores the hair’s sheen, luster, and shine. It not only makes the hair soft, but it also enhances strength and suppleness. It naturally combats frizz but does not have the greasy buildup that many hair care products leave behind. Regardless of the scalp or hair’s condition, whether too oily or too dry, aloe vera can restore the proper balance. It has amazing results for promoting hair growth as well as staving off hair loss. Say goodbye to expensive and often ineffective hair treatments. Try aloe vera, nature’s own remedy for restoring health and beauty to hair. I gotta admit, after realizing just how many chemicals are in our hair products, it’s a relief to find all natural healing solutions for hair using Aloe Vera!You can check out this other post for Natural Healing Aloe Vera Shampoo and Conditioner Recipes. Have you seen benefits from Aloe Vera in your hair care regimen? Share some of your wisdom below. Make sure to tweet this post!